Dirty Habit’s menu primarily consists of small plates that are meant to be shared. You’ll find chicken wings, a beet salad, mussels — things that can easily be divided on to separate plates and between several people. 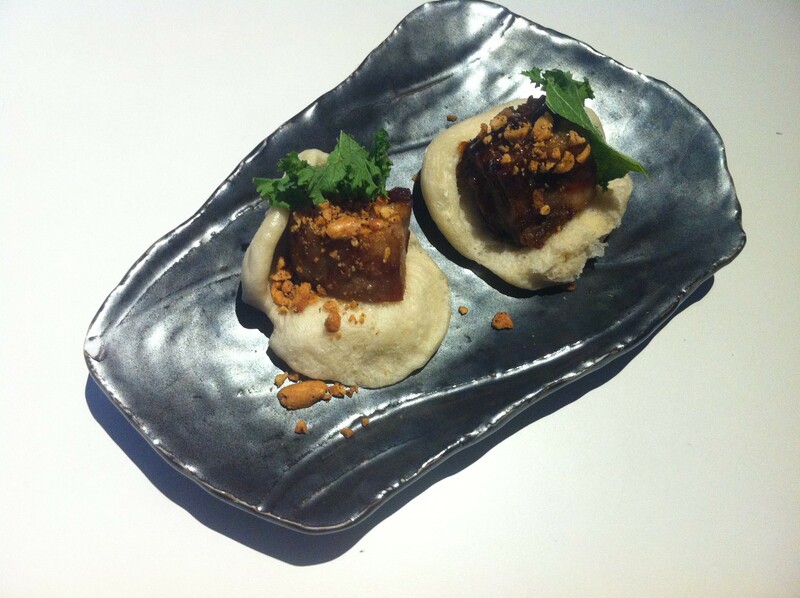 But there is one delicious, delicious exception: the fried lamb belly buns. At $5 each and sized slightly smaller than a taco, you can’t really split them. Turns out, this is a good thing because after one bite you won't even think about sharing this plate. Lamb belly is confit proper in legit lamb fat for six hours until it’s cooked through. It’s then pressed and cooled overnight. Prior to serving, the pieces of lamb belly are fried up. The result is juicy, fatty, crispy lamby goodness. It's like pork belly, but gamier. The “lambiness” is tempered by the housemade “hoisin” that covers the fluffy, steamed, also-housemade bao. The sauce is made from pomegranate molasses and its sweetness complements the lamb belly brilliantly. Szechuan- and cayenne-spiced peanuts top the bao along with a single leaf of mustard green, both of which provide a slightly spicy kick. What's really interesting and noteworthy is that this dish isn’t a creation of the talented and well-known executive chef David Bazirgan, but rather of sous chef Frances Ang, a former pastry chef of Fifth Floor. Hailing from the Philippines, he also does a number of other Asian-inspired dishes that scatter through the extensive menu. But that lamb belly, though. Follow @streetfoodsf for all things delicious.